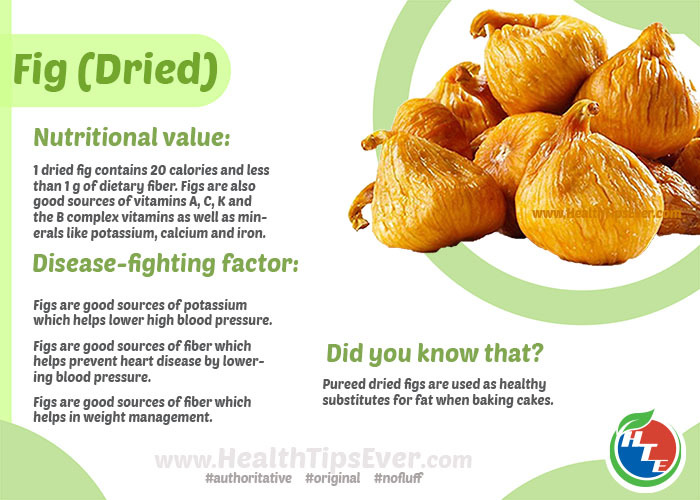 1 dried fig contains 20 calories and less than 1 g of dietary fiber. Figs are also good sources of vitamins A, C, K and the B complex vitamins as well as minerals like potassium, calcium and iron. Figs are good sources of potassium which helps lower high blood pressure. Figs are good sources of fiber which helps prevent heart disease by lowering blood pressure. Figs are good sources of fiber which helps in weight management. Pureed dried figs are used as healthy substitutes for fat when baking cakes.